Our min-o electrical connector range is a further development of the single way Mini-Coax Connector set, utilising common parts for improved lead times. 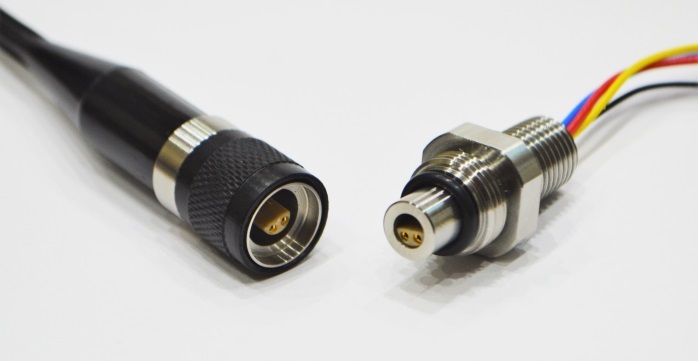 Currently rated to 3,000m with a 15mm overall connector diameter, this product offers significant space saving benefits. It has been designed to accommodate commercially available single, 2, 3, 4 and 6-way inserts. Available as flanged or through hole mounted bulkheads, inline male and female connectors terminated to standard or customer supplied cables. A right angle moulded variant is also available. Ideally suited for applications where a small, lightweight reliable connection is required, such as Pipeline pigging, Diver comms., AUVs, control & instrumentation and sensors. Available in 316 Stainless Steel or Naval Brass as standard, titanium, aluminium, non-metallic or other options available on request. Currently rated to 3,000m depth as standard, contact us for enhanced ratings. Bespoke options available on request, UK manufactured for fast-turnaround deliveries. Drymate assembly, positively engaged keyway system. Supplied with a range of standard cable types to suit the application, customer supplied cables can be accommodated subject to specification review. Simple, robust construction ideal for subsea sensors, pins/sockets in each mating half.